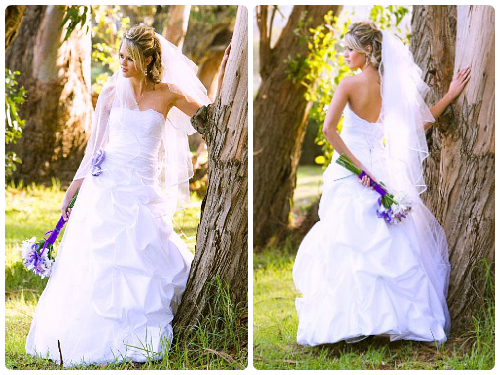 Beautiful Charlene chose a ball gown wedding dress, detailed with lace and ... purple. The stark white of her dress worked soo beautifully with the shade of purple she chose. I think Charlene made a wonderful choice in allowing her bridesmaids to choose their own dress style, while using the same fabric/colours. Her bridesmaids could feel comfortable on the wedding day and still have a dress they would wear after the event. While Charlene looked like an absolute princess on her wedding day, her fun side showed when she donned her purple gumboots to have some 'rough 'n ready' shots taken. I particularly love the contrast of the shots in the hollow old tree ... lace and tulle vs gnarly old bark. Which is your favourite photo?